Auxiliary Bishop Raymond F. Chappetto was to be the main celebrant of the funeral Mass. Born in Trento, Italy, he attended Haaren Aviation H.S., Manhattan; New York University’s Washington Square College of Arts and Sciences, Manhattan; Jordan Seminary in Menominee. Mich.; and Mount St. Mary Seminary, Emmitsburg, Md. He did graduate work at Iona and Princeton Theological Seminary, Princeton, N.J. He was ordained to the priesthood on May 28, 1966. He served as an assistant at St. Rita’s, East New York, 1966-77, and St. Gabriel, East Elmhurst, 1977-82. He was named administrator of St. Benedict the Moor parish, Jamaica, in 1982. He became pastor there in February, 1985 and served there until 1994. In 1983, he was appointed chaplain of Mount St. Mary’s Cemetery, Flushing, with residence at Sacred Heart, East Glendale. He retired in 2012 and remained in residence at Sacred Heart parish. Two years later, he moved to the Bishop Mugavero Residence for Senior Priests in Douglaston. Before entering the priesthood, he worked as a professional photographer and production manager. A U.S. Army veteran of both World War II and the Korean War, he was awarded a citation for meritorious service with the Eighth Army in Korea and also earned the Korean Service Ribbon with Silver Star. Msgr. Michael J. Reid, chief operating officer of Catholic Cemeteries for the Diocese of Brooklyn, knew Msgr. Zanon for many years. “Father Zanon loved his life and job,” said Msgr. Reid. “He found his work very fulfilling and rewarding. He developed great love for the church ritual of the burial. He was a great source of comfort and care for families during the time of their greatest need. So many people were able to find peace because of the love and care he was able to provide for them. “He was outgoing and outspoken but always reliable and was always there. 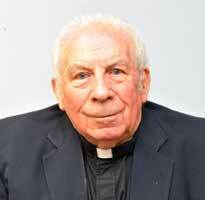 He truly loved being a priest and was great at what he did,” he said. Burial was scheduled for Mount St. Mary Cemetery. It was raining, and I was alone on my way to my mother’s grave over thirty years ago. She had just been buried two days ago when I stopped in my tracks. I saw a priest standing behind a casket on a grave in the rain, all alone. A priest, a coffin, and no one else. I stopped to show my respect. I remained there for the whole service, standing in the rain. Afterward, Father Zanon asked me if I was family. I said no. I was on my way to my mother’s grave. Father Zanon replied, “I would like to walk with you to your mother’s grave, and bless her.” Who else would walk with me, in the rain, without an umbrella to a grave of someone he did not know. He blessed Mama in the rain, and this was the beginning of a long friendship. standing all alone behind a casket, in the rain. I walked over to join in prayer to show respect. No one should be buried all alone. In life, not being remembered is such a shame. was as if there were a thousand people present. The deceased would be proud. In the rain, your voice rose into the clouds. I knew the raindrops were from God to let us know no one is forgotten. He shed his tears for those who are alone, never to be forgotten! I will always remember that day, in the rain. From that day on, I saw the sunlight. being there when I needed you most!